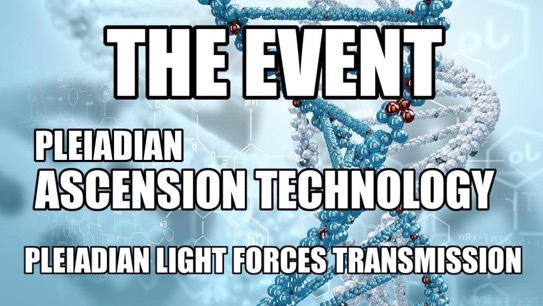 THE FORCES OF LIGHT COME NOW TO SPEAK CLEARLY TO YOU ABOUT WHAT IS TRANSPIRING WITH HUMANITY'S ASCENSION EVENT! LET'S JUST SAY YOU PLAYED A BIG ROLE IN SETTING ALL OF THIS UP! WE WANT YOU TO BE AWARE HERE THAT ITS NOT ABOUT THE STORY OR MESSAGE, ITS ABOUT WHAT'S ENCODED IN THE STORY OR MESSAGE! "WHAT IS THOUGHT OF AS ADVANCED IS ALWAYS VERY SIMPLE AND IT ALL WORKS PERFECTLY WITHIN THE LAWS OF NATURE!" THERE WILL BE A POINT IN EARTH'S NEAR FUTURE WHEN THEY ALL WILL WAKE UP AND THIS IS WHY YOU ARE ULTIMATELY HERE! NOTE: WE WANT TO MAKE IT CLEAR HERE THAT THE WORD "BRAIN WAVE" IS THE WRONG PHRASE! A MORE BETTER DESCRIPTIVE PHRASE WOULD BE, BODY-WAVE OR CELL-WAVE!" INTERNAL FREQUENCY MEANS, "BRAIN-WAVE, BODY-WAVE AND BETTER YET, CELL-WAVE , AND EVEN BETTER, DNA WAVE!" THE WORD 'PRAYER' IN THE CHRISTIAN BIBLE SIMPLY MEANS MEDITATION'. YOU ARE INSTRUCTED THERE TO, "PRAY (MEDITATE) WITHOUT CEASING!" WHILE PRAYER IS A FORM OF ASKING, IT MEANS TO ASK FOR SOMETHING BY MATCHING ITS VIBRATION BY MEDITATING ON IT AND IT CERTAINLY DOESN'T MEAN TO BEG SOME BEING YOU THINK IS HIGHER THAN YOU FOR A THING! SINCE 9-11-2018 A MULTITUDE OF ADVANCED BENEVOLENT BEINGS ENTERED INTO THIS GALAXY THROUGH A SPECIAL MULTI-DIMENSIONAL PORTAL NEAR EARTH'S SUN! WHEN YOUR DNA IS UPGRADED EVEN TO THE 5TH STRAND YOU WILL BE ABLE TO SEE OTHER, MORE BEAUTIFUL WORLDS THAT DIDN'T SEEM TO EXIST BEFORE! IN ONE SENSE IT'S LIKE THE HIGHER BEING VERSION OF YOU CAME BACK THROUGH TIME TO SAVE YOU! THIS IS WHAT YOU HAVE BEEN DOING THE WHOLE TIME AND NOW ITS TIME FOR YOUR 'AHAAA' MOMENT! THE 'AHAAA' MOMENT IS SIMPLY WHERE YOU WILL BE IN YOUR AWARENESS WHEN YOU GET TO THIS POINT IN THIS GRAND COSMIC DRAMA YOU ARE DOING! YOU EVEN MAKE THE GAME MORE INTERESTING BY PRETENDING YOU DON'T KNOW WHO YOU TRULY ARE SOMETIMES AND YOU EVEN GET OTHER PARTS OF YOURSELF TO SEND YOU MESSAGES LIKE THIS TO RE-MIND YOU ABOUT WHAT YOU ARE DOING! YOU CAME TO WAKE UP ALL THOSE WHO WERE SLEEPI AND NOW YOU ARE DOING THE "GREATER THINGS" WRITTEN ABOUT IN ANCIENT BOOKS!